1. Read all the materials at least 10 times. When you read, please take down notes. 2. Invest three (3) hours daily on your studies, so that you won’t cram at the last minute. Avoid studying more than four (4) hours daily, because it is not productive. NOTE: Take frequent breaks. Do not study for 3 hours straight. 3. Take *each* online quiz at least two times each week. 4. In the month before the actual Real Estate Brokers’ Exam month, take each online quiz four times each week. 5. In the face-to-face review, take down notes and ask your CRESAR speaker to clarify the things you did not understand. 6. Between today and the month of the REB Exam, please avoid watching TV. The sacrifice is worth it. 7. In the three days just before the REB Exams, please REST. Ideally, as early as two months before the REB Exams, please get 7 hours of sleep daily. If, for example, you only got 6 hours of sleep the night before, try to sneak in two 30-minute naps during the day so that your DAILY total is 7 hours of sleep. We’ve seen that when people take the review seriously, they are able to pass the REB Exam. The numbers above are in minutes. In the table above, you’ll see that the recommended study time for Thursday is 200 minutes. Actually, if you listen to Audio 1 and read Reading 14 (Terminologies / Glossary) simultaneously, you can save 20 minutes and thus end up with a review time of 180 minutes for Thursday. If you’re unable to set aside 3 hours a day for your studies, that simply means you will need to start studying earlier to avoid cramming at the last minute. For example, cut the schedule in half, but study over a 16-week period. Again, please take note that the above is just an EXAMPLE. After all, not everyone will be aiming for the Top 10. Just the same, we still encourage you to aim for a score high enough to make it to the Top 10. That way, even if life’s emergencies interfere with your study schedule, you’ll still pass the Real Estate Brokers’ Licensure Exams because you aimed high (and took action) right from the very beginning. 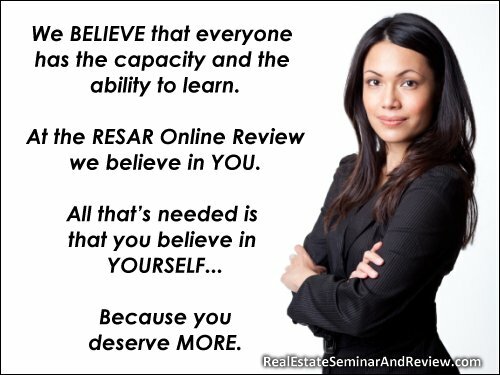 Where can i attend seminar if i want to be a license real estate broker? thanks. when is the next real estate brokers exam?! thanks. [From RESAR] We haven’t seen any offical PRC announcement yet. In the past, the REB Exams were held in March 2011 and March 2012. Thanks! when is the next real estate brokers exams?thanks! [From RESAR] While the past 2 REB Exams were held in March 2011 and March 2012, we are waiting for the Official 2013 Schedule of Exams of the PRC. Thanks. please send me an email.. how to start my online review. On that page, please join the RESAR Online Review Announcement List. Do you conduct reviews in Cebu? pls let me know? Thanks. Do you have a review program conducted in makati and kindly furnish me a copy of the sched and how to contact your office. Thank you! Hi sir do you have a 120 review sched every weekends, and do you know the tel# of PRC. thank you. [From the Admin] Hi! The topics are different. We highly encourage you, however, to get in touch with the PRC and find out from them if they are willing to issue you an Examination Permit for the upcoming March 18, 2012 Real Estate Brokers’ Licensure Exams, based on your Certificate of Attendance in the Real Estate Appraisers’ review. Thanks! [From the Admin] Hello! From what we’ve seen, there are 60-hour review classes (face-to-face Comprehensive Real Estate Seminar and Review or CRESAR) that cost P10,000. [From the Admin] No, there’s no required work experience. If you can get a notarized certification from your real estate property developer or licensed real estate brokers regarding your 60 hours OJT, that will help serve as proof that you have earned 60 units (out of the required 120 units) in real estate subjects. Thanks! [From the Admin] Hi! If ever we hear of CRESARs in the North, we will publish the info online. Thanks! Thanks for the tips on how to pass the board exam and study guides.I would like to ask why some review center offers only 60 hours compare to 120 hours being offered by the other review center for the Real Estate Broker Exam. 1) What is the exact number of hours prescribed by the PRC? who had 60 hrs of review? If you opt for a 60-hour CRESAR just make sure you’re able to get into a 60-hour OJT program. If you go for a 60-hour CRESAR and then are unable to apply for a 60-hour OJT, then enroll in another 60-hour CRESAR to complete the 120-hour requirement.